Tim Ward is the co-owner of Intermedia Communications Training and co-author of The Master Communicator’s Handbook - a resource for experts and thought leaders seeking to create meaningful change. Question 1: The news has mostly covered the decline of commercial honeybees - how have populations of wild pollinators been affected in recent years? Answer: Research suggests some wild pollinators, such as bumble bees, are declining as well. For most species we just don't know since there are limited historic data available. For example, if you were to survey bees in your garden and found 30 bees representing 10 species, would that be good or bad? We need collection records from the same place over time to track changes in bee abundance, diversity and community composition. This is especially complex because bees are very, very diverse. There are over 20,000 species of bees, which is more than all species of mammals, reptiles and amphibians combined! They range from big and fuzzy to tiny and shiny. Some of the most common species are metallic green and blue. Though most are about the size of your pinky nail, some are the size of your thumb, and others could nearly fly through a window screen. Overall, though the status of each and every species is not well-understood, we do know some are in decline, and we can't go wrong by trying to support and protect our native pollinators as best as we can. Question 2: Why is maintaining healthy populations of wild pollinators such as bees important? Answer: Wild bees deserve conservation attention in their own right, but from our perspective, it is especially important because they can provide pollination insurance in the face of honeybee declines. Bees pollinate many of our favorite foods like apples, oranges, almonds, cherries and berries, pumpkins and squash, and so many more. In fact, you can thank a pollinator for every third bite of food you eat! To maintain diverse and abundant bee communities we need to support their habitat needs, a place to live and food to eat. In your garden, providing bee habitat really means less work for you! For food, choose plants that will bloom at different times so there is nectar and pollen available for bees from spring to fall. Native wildflowers won't require much attention or watering and a variety of species tend to have naturally staggered bloom times. The majority of our wild bees are solitary and do not live in hives, instead females excavate small tunnel nests into soil and wood. To provide nesting habitat, don't put mulch everywhere and leave some fallen limbs or cut logs out in the yard. Check out recommendations made at www.xerces.org for ways to create pollinator habitat in your own yard. Even if you aren't growing fruits and veggies over 90% of flowering plants need a pollinator! 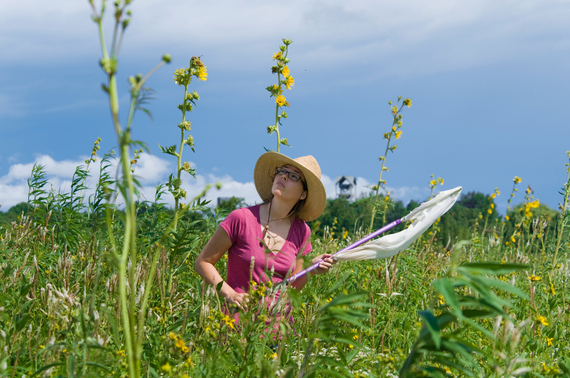 Dr. Rebecca Tonietto searching for bees in the prairie at the Chicago Botanic Garden (photo credit: Robin Carlson). Question 3: Why target shrinking cities as refuge areas for pollinators? Answer: It may be surprising, but studies from cities around the world report high levels of bee diversity and abundance, even including some rare specialized bees. Naturally patchy habitat is the norm in meadows and prairies and the urban mosaic isn't necessarily all that different. Imagine walking down a residential urban block in the summertime. There are clusters of brightly colored flowers blooming here and there, in window boxes and pots on stoops, in the landscaping between the road and sidewalk, the dandelions and clover dotting the park lawn. All of that may just look pretty to us, but it's a buffet for bees. Nooks and crannies in buildings and other structures can be great nesting habitat for some species, as are patches of bare ground for others. Beyond food and nesting sites, cities offer escape from many agricultural pesticides, and even reduced herbivory pressure on rare host plants some specialist bees can't live without. In shrinking cities new green spaces are created as the city depopulates. For these reasons, shrinking cities in particular can offer relief from the two main factors negatively impacting pollinators: exposure to pesticides and habitat loss. Question 4: What benefits do wild bees bring to city dwellers than could make people want to attract the insects? Answer: First, wild bees are pollinators and the majority of flowering plants require a pollinator. Many urban farmers and gardeners do not keep honeybees, and rely on wild bees for pollination services to grow fresh, local fruits and vegetables. Second, bee habitat is beautiful! What would you prefer to see, concrete or dense patches of blooming wildflowers? Establishing bee habitat by creating pollinator gardens or simply planting more flowering plants in general makes urban areas more aesthetically pleasing. Third, there is a measurable psychological benefit we gain from urban biodiversity. Just the bees being there, let alone helping to pollinate many of the flowering plants we enjoy to look at and eat, is a benefit it and of itself. Question 5: What kinds of success have you seen so far from these programs? Answer: Pollinator-friendly gardens attract pollinators. 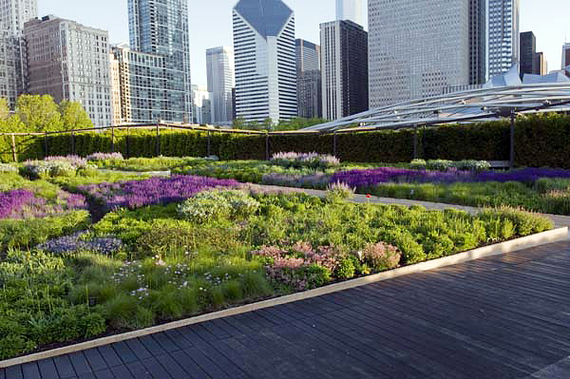 For example, I surveyed bees on green roofs and in city parks in Chicago. I collected a new bee species to Illinois (a new state record!) from the middle of Millennium Park in the Lurie Garden, which is full of beautiful native prairie plants. Big waving sunflowers, bursts of purple bee balm, tall coneflowers ranging from yellow to white to pink and many, many more. If a small garden smack in the middle of Chicago can support such a rare species indicative of high-quality habitat, imagine the conservation potential if everyone had at least one patch of wildflowers blooming in their yard. By considering bees needs in our gardens, yards and cities we can combat habitat lost to agricultural expansion, and provide bees with the food and housing they need to thrive. If we build it, they will come! Dr. Rebecca Tonietto is a community ecologist studying wild bee communities in shrinking cities. She is currently a David H. Smith Postdoctoral Fellow in Conservation Biology academically based at Saint Louis University. She explores ways that native bee conservation, sustainable urban agriculture and policy can work together for common goals. Tim Ward is co-owner of Intermedia Communications Training, Inc, a Washington D.C. based firm that specializes in communications for development, economics, science and the environment, and the co-author of The Master Communicator's Handbook.